With a local visit today we got to sleep in a bit since we left at 10:00 rather than the usual 8:00 – a nice reprieve! All of the GAIA staff and Sally Rankin from UCSF International Nursing program were meeting with the USAID representatives regarding details of a recent grant to GAIA for nursing scholarships and training in field maternity training. The rest of us went to the Open Arms Infant Home in Blantyre which is supported by various church and other groups in the UK as well as GAIA through it’s small grants program. This is an extremely well run care facility for about 50 children mostly under 2 who have been abandoned, or left without a mother due to death in childbirth or other illness – frequently AIDs, by a family member who cannot care for such a young child for whatever reason. The home maintains contact with remaining family members if known who visit the children when they can during their first 2 years when they are cared for by Open Arms, well nourished and given immunizations. At the age of 2, the children are healthy and able to return to their village with the relative who has been visiting over the years. To transition them, the relative comes and lives with the child in a house on the Open Arms campus that is just like a village home where the child and their relative bond for 1-2 weeks and the child adapts to a similar environment to the one in which he will be living once he leaves. There are here also older children still at the facility who have no known relatives – currently numbering 10. 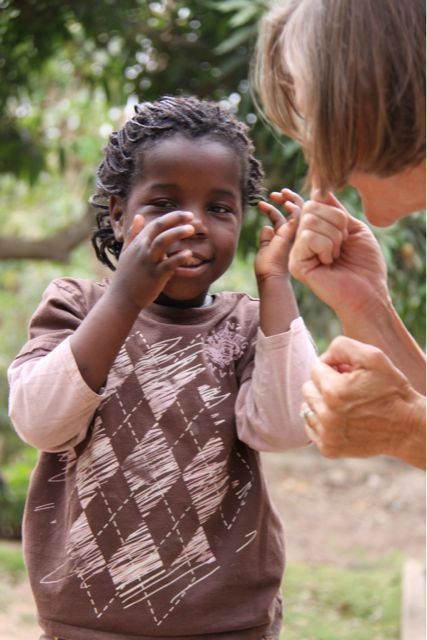 They are cared for until either adopted by someone living in Malawi (per adoption laws dating from 1948) or sent to a Foster Home, of which OA has purchased 5. These homes are cared for by 2 women who can bring 2 of their own children and then adopt 4-6 foster children as their own for life. These homes are financed by various groups or organizations mostly in the UK. OA also endeavors to find “nurseries” in the villages to which their children return, so they can be a feeding center, insuring that 60 children get at least one good meal a day. While OA provides food (probably Likuni Phalla) for 60 they are well aware that these feeding centers end up supporting considerably more children than that. 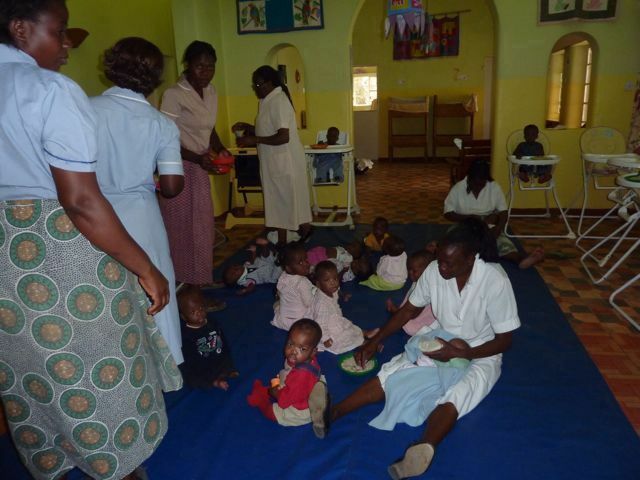 If there is no nursery available, OA will build one either through specific funding or through J&J which sends employees to Malawi for this purpose regularly. One nursery was set up 3 years ago with solar electricity costing $1,600 which provides for 4 lights and a mobile phone charging station very successfully. It is the director’s opinion that the number of abandoned children is increasing in Malawi. The reason has to do with the increase in mental illness among the child-bearing population and the social breakdown there that is resulting from the loss of so much of the parent population to AIDS over the last few decades. Fewer of these orphans are dying of AIDS than in the past due to the availability of ARVs for children which is at least one positive development. The lot of children across Malawi is not really improving much if any and so the outlook feels bleak to this ED. There are simply too many children to be cared for and too few people available. Moreover, crises like the current measles outbreak are devastating with considerable under-reporting of the actual number of people affected, in this case the number of children who have died. He is aware of district health clinics that have been unable to diagnose the measles even in the midst of this outbreak with the result of may children dying needlessly. We lunched at Ryall’s, the nicest hotel in Blantyre, went to Lambett’s to buy chitenga (like sarongs) fabrics, went back to pull together our day and then dined at 21 Grill, the nicest restaurant in Blantyre which is at Ryall’s where Andy, GAIA’s local data researcher, and his lovely wife and 1 1/2 year old joined us for dinner. We are driven back through the security gate and “home” by the wonderful GAIA staffers, Austin and Daniel. This entry was posted in Uncategorized and tagged AIDS, GAIA, Malawi. Bookmark the permalink.